How did Robin of Loxley become Robin Hood? Why did he choose to fight injustice instead of robbing for his own gain? Expressive and gritty, this graphic novel whisks readers back to Crusades-era England, where the Sheriff of Nottingham rules with an iron fist, and in the haunted heart of Sherwood Forest, a defiant rogue — with the help of his men and the lovely Maid Marian — disguises himself to become an outlaw. I’m no stranger to Robin Hood tales. Not only am I a HUGE fan of just about every Robin Hood movie (including Robin and the Seven Hoods…yeah Frank Sinatra! ), but I also wrote an in-depth college research paper on the Robin Hood ballads in historical context. I like Robin Hood. 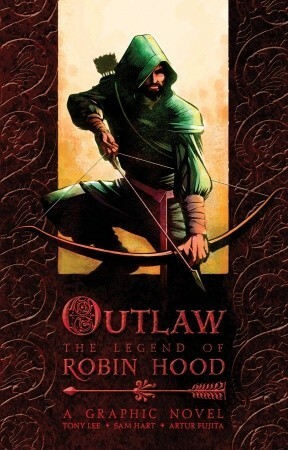 Outlaw: The Legend of Robin Hood isn’t anything new, but it’s still a fun read. This Robin of Loxley is extremely self-assured, a ladies man, and a savior of the poor. His past is a bit more troubled than in many tales, but it serves as a strong background for the outlaw he’ll one day become. I’m only giving the book 3 stars because of the artwork. Apparently all of the characters were constantly standing in dark corners or some really wicked shadows. They never had any eyes or facial expressions which got a little annoying. But that being said, I still recommend it!